Complexity is the enemy of adoption. Anything that is too complicated just won't happen. For battery powered electric cars two of the barriers to adoption have been range anxiety and the time it takes to recharge the batteries. There are thousands of gas stations for conventional automobiles and fueling up only takes a few minutes. There is no equivalent infrastructure for battery powered electric cars. 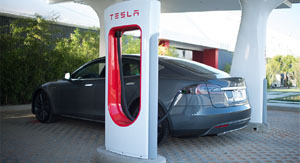 Elon Musk took the bull by the horns and built a number of supercharging stations across continental USA providing free fuel (electricity) to his Tesla customers. Currently there are approximately 80 supercharging stations and the build-out continues at a steady fast pace. It takes about 40 minutes to charge the battery to 80% of capacity and another 35 minutes to reach full charge. If the next supercharging station in your itinerary is not too distant you can safely leave with less than full charge. Recharging a Tesla takes a lot longer then fueling a conventional car but if you combine the pit stop with a meal or some other activity it should not be a hardship at all. As the transcontinental supercharging stations were being built, Elon Musk announced his intention to drive coast to coast, West to East, charging up only at Tesla supercharging stations. When John Glenney heard about it, he decided to beat Musk to it but driving East to West. Glenney's cross country journey is reported by Mark Rogowsky in Forbes. Calbraith Perry Rodgers, flying a Wright Model EX designed for exhibition flights, was the first pilot to fly coast to coast starting on September 17, 1911 from Sheepshead Bay, New York and arriving on November 5, 1911 in Pasadena, California. Will Glenney be remembered in 2114? Of note to investors, Glenney paid for his Tesla with the profit he made on Tesla stock that he had bought two years earlier at $22. Every technology has a hurdle to pass to get into mainstream use. It's called Crossing The Chasm after Geoffrey Moore's marketing book by the same name. New technology is adopted in stages. The technology curious, the "Innovators," try it out because it's fun to try out new things. If they like it a group of "Early Adopters" buy it to try to get an edge on the competition. The next group, the "Early Majority," is much harder to convince. They are pragmatists who want proof of concept but who don't want to experiment like the Early Adopters before them. The "Chasm" is the gap between Early Adopters and Early Majority which often proves fatal. I don't think it's a coincidence that the Tesla car models correspond to the stages of TALC, Elon Musk is a Silicon Valley veteran and Geoffrey Moore is a valley marketing consultant. 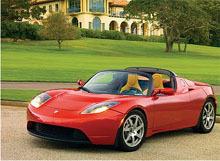 First there was the Tesla Roadster for the Innovators, built in small numbers for the small number of innovators. For the Early Adopters there is the Tesla Model S. Getting ready for the mass market, the Early Majority, Tesla is developing the Model E.
It looks like a well thought out plan, learning at each stage to incorporate improvements in the next one. But the big hurdle is yet to come, crossing the chasm. Getting in early is a big gamble that paid off big for John Glenney. While he is an "Innovator" most of us are pragmatists or "Early Majority" in TALC terms. At this point the stock is pricey and the risk of the chasm still lies ahead. For the risk averse investor it's probably best to wait for the chasm crossing which often is accompanied by a large retrenchment in the stock price, often 50%. A reevaluation of Tesla at that point should lead to the investment decision. Last updated February 3, 2014.